Andrés Iniesta is to join Japanese club Vissel Kobe. The midfielder has spent 22 years with FC Barcelona, the last 16 of which as a first team player, but now makes the switch to the Japanese J1 League to represent the club from the capital of the area of Hyogo. Right now, the J1 League is 15 games into the season with Vissel Kobe in sixth place in the table, 15 points behind leaders Sanfrecce Hiroshima. It was on 27 April that Iniesta announced his decision to leave FC Barcelona, just two days after claiming his 32nd trophy with the Club. The man from La Mancha, along with Leo Messi, has won more silverware than anyone else in the Club’s history. Along with Messi, Iniesta has also won more league titles than anyone else at Barça and with 674 appearances, he is behind only Xavi Hernández on the all-time list. According to reports in the Japanese media, Iniesta´s contract with Vissel Kobe is a 3-year deal, and he will wear the same number 8 shirt that he used for 11 seasons at Barça. A welcoming event for Iniesta from his new club is set for May 26th at the Noevo Stadium Kobe. Since the announcement on 27 April, Iniesta has little by little said his goodbyes at FC Barcelona. The last week in particular has been emotional with his last away trip - the game in South Africa against Mamelodi Sundowns - his final training session with his team mates and his last appearance as a Barça player at Camp Nou in the league game against Real Sociedad. Amidst all the action on the field there was also a moving institutional farewell in which team mates past and present, family members, coaches, board members and personalities from the world of sport came together to pay tribute to Andrés Iniesta at Camp Nou. 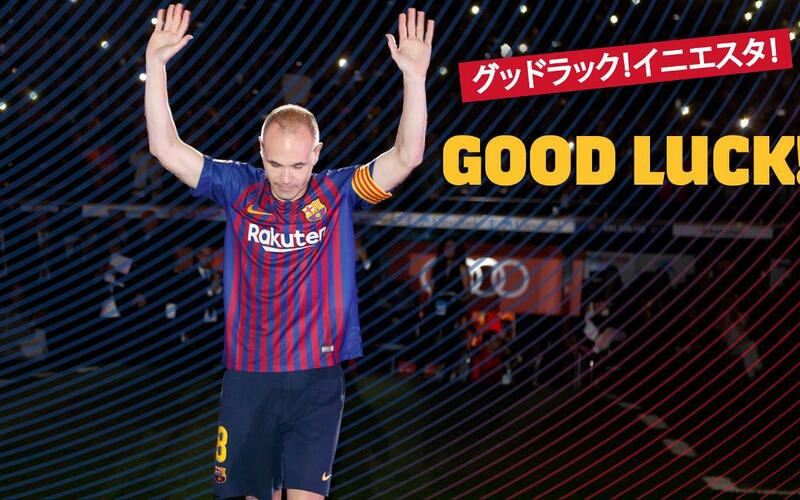 Now the Barça legend will start a new adventure in Japan. All the best, Andrés!